Animal Ambition is the fifth studio album by American rapper 50 Cent. The album was released on June 3, 2014, by G-Unit Records and Caroline. All 11 tracks on the standard edition were issued as singles prior to the album's release; in order, they are "Don't Worry 'Bout It", "Hold On", "Pilot", "Smoke", "Hustler", "Chase the Paper", "Everytime I Come Around", "Irregular Heartbeat", "Winners Circle", "Twisted", and "Animal Ambition". The album features guest appearances from Yo Gotti, Trey Songz, Kidd Kidd, Jadakiss, Mr Probz, Guordan Banks, Prodigy, Schoolboy Q and Styles P.
On December 4, 2013, while doing a press run for the launch of his SMS Audio line of headphones and speakers he announced that a "full body of work", titled Animal Ambition would be released in January 2014. In a December 2013, interview with DJ Whoo Kid, he reiterated plans for the album, saying: "I'm going to drop it in January, it's a full body of work, I wouldn't call it a mixtape because it's a higher grade than the material that I put out on mixtapes. I recorded so many album quality songs that I'm going to put the Animal project out as my viral marketing plan and then it will come out after, Street King Immortal." In January 2014, while visiting the Consumer Electronics Show, he explained his motivation to release new music in early 2014, saying: "I’m so anxious to put out material. It took me so long to get the business portion of music straight, because I had went through an auditing process because it was the last record required for Interscope Records. And now, I got Animal Ambition, I was inspired to write this. It really has to be current. If it’s not like right now, what I feel is like the hottest thing, I know it’s done right, but it’s not necessarily what I should be doing right now." In a January 2014 interview with Sonic Electronix, he said that he was recording heavily in preparation for both of the albums, saying, "I want to put Animal Ambition out in the first quarter. And then it’ll lead up to Street King Immortal. So it’ll be twelve weeks. That’s why I’m working so hard, when I leave here I go straight back to record again." He also said that Animal Ambition has a shared sound and theme throughout, saying, "With Animal Ambition, the project is about prosperity. I got an interesting way of writing it, ‘cause I wrote it from a distorted vision or viewpoint. When Biggie was doing ‘Damn, niggas wanna stick me for my paper, damn,’ that’s about when you get something, the effects of others responding to you doing better. The jealousies connected to it, there’s so many different ways to write it, that the album has those facets to it. The overall theme is ambition and prosperity." "There’s an album I am putting out before Street King Immortal. The title is called Animal Ambition. It’s an untamed desire to win. The record is overall about prosperity, ambition, and has an entrepreneurial energy—it’s all from a distorted perspective. I just been really excited about the concept, been writing and had a lot of time to create material for the release because it’s taken so long. So when you listen the record, you’ll see it because I told you it, it’s about ambition. If I didn’t say that, you wouldn’t listen to the record and say what’s that song called? Cause when Biggie was saying, "Damn, niggas wanna stick me for my paper," that’s writing prosperity, but the effects of it from others. Jealousy is created from you moving forward. I wrote it from a lot of different angles in order to create an album with all the facets I was comfortable with so it could all have one thing." On February 20, 2014, 50 Cent left Shady Records, Aftermath Entertainment and Interscope Records, after a 12-year union and subsequently signed himself and G-Unit Records to Caroline, an independent distributor of Capitol Music Group. On the same day, he announced that the album would be released on June 3, 2014. In a February 2014, interview with Forbes detailing his departure from Interscope 50 stated, "I’m a special case and situation. It’s also because of the leverage of having the strong relationships with Eminem and Dr. Dre. They don’t want me to be uncomfortable. They value our friendship to the point that they would never want [to jeopardize] it over that little bit of money." In a May 2014, interview with the Business News Network, he spoke about the album's promotional campaign, saying: "I actually decided to create a campaign for the actual record that can sustain the audience. Because it has to sustain your interest for one week until the next song comes, until the next song comes, until the next song comes. And the actual visuals match the song so if you weren’t impressed by the music you’ll understand creatively why it’s the way it is when you see the images. It’s obviously a more complex presentation because you have to be really premeditated. You have to know what each one of your songs are gonna feel like. We only needed to know what three looked like. With three records because we’re only shooting three music videos before you sold millions of records. The adjustments are technology." In June 2014, 50 announced that he would be accepting Bitcoin payments for the album, making him one of the biggest artists to use the cryptocurrency to date. On February 21, 2014, the music video was released for "The Funeral". On March 18, 2014, the songs "Don't Worry 'Bout It", featuring Yo Gotti and "Hold On", were released via digital distribution, as the album's first and second singles. On March 18, 2014, the music video was released for "Hold On". On the same day, the music video was released for "Don't Worry 'Bout It" featuring Yo Gotti. On March 25, 2014, the album's third single "Pilot" was released. On the same day, the music video was released for "Pilot". On March 31, 2014, the album's fourth single "Smoke" featuring Trey Songz and produced by Dr. Dre was serviced to mainstream urban radio in the United States. The following day, the music video was released for "Smoke" featuring Trey Songz. On April 15, 2014, the album's fifth single "Hustler" was released. On the same day, the music video for "Hustler" was released. On April 21, 2014, the music video for "Chase the Paper" featuring Prodigy, Kidd Kidd and Styles P premiered on MTV Jams. The following day, "Chase the Paper" was released as the album's sixth single. On April 29, 2014, the album's seventh single "Everytime I Come Around" featuring Kidd Kidd was released. On the same day, the music video was released for "Everytime I Come Around". On May 6, 2014, the album's eighth single "Irregular Heartbeat" featuring Jadakiss and Kidd Kidd was released. On the same day, the music video was released for "Irregular Heartbeat". On May 13, 2014, the album's ninth single "Winners Circle" featuring Guordan Banks was released. On the same day, the music video was released for "Winners Circle" featuring Guordan Banks. On May 19, 2014, the music video was released for "Twisted" featuring Mr Probz. On May 20, 2014, the album's tenth single "Twisted" featuring Mr. Probz was released. On May 30, 2014, the album's eleventh single "Animal Ambition" was released. On June 3, 2014, the music video was released for "Animal Ambition". On June 24, 2014, the music video was released for "You Know". Animal Ambition was met with generally mixed reviews. At Metacritic, which assigns a normalized rating out of 100 to reviews from critics, the album received an average score of 53, which indicates "mixed or average reviews", based on 15 reviews. Killian Fox of The Guardian wrote "unchanged are his limitations as a rapper, both technically and in his choice of subjects." Also adding, "The theme here, we are told, is prosperity and its discontents, but he doesn't do much more than flaunt it and berate people for hating his success." Sheldon Pearce of HipHopDX said, "This release was essentially pitched as a concept album on how wealth alters perception and inspires envy, and though it's possible to follow this loose narrative, the execution of this idea is thoroughly botched. In truth, this wouldn’t be so difficult to stomach if he wasn’t still rapping (both lyrically and contextually) like it’s 2004. Animal Ambition is a drastically underperformed gut punch marred by its own limitations and its obsessive portrayal of self-worth amid a recitation of Get Rich or Die Tryin’ buzzwords." David Jeffries of AllMusic said, "Consider it the album before the album, and it plays out as interesting and often awesome, but put this next to his major works and it seems a bit off and quirky." Simon Vozick-Levinson of Rolling Stone wrote "Tracks like "Hold On" and "Pilot" have all the smirking charm of 50's glory days. At their best, they can even recall his time as a mixtape hustler with a world to conquer and nothing to lose." Jabbari Weekes of Exclaim! wrote "Animal Ambition showcases a very creatively confused 50 Cent, trapped in some sort of musical purgatory we can only hope he find his way out of." Brandon Soderberg of Spin said, "Animal Ambition half-assedly pimps the phony idea perpetuated by his Jesse Pinkman-like core fans and an increasingly clueless 50 Cent himself: that his success was built on bona fide gangster rap swagger rather than incredibly accessible club bangers." Ian Cohen of Pitchfork Media said, "There may not be much Curtis Jackson on Animal Ambition, but it does give an accurate survey of where 50 Cent is at right now." Eric Diep of XXL said, "50 Cent’s credibility as a viable solo artist is still being tested every day. In a rare occasion for Fif, Animal Ambition has got everyone back on the 50 bandwagon and rooting for the second wind in his career. Now, with talks of a G-Unit album later this year, 50 Cent is on the fast-track to becoming the unstoppable force he once was. 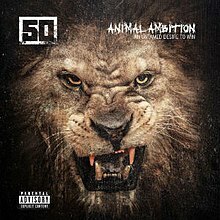 All of this only means 50 has to push even harder to elevate his status to that level, and with Animal Ambition, he shows he’s ready to put in the work." Jordan Sowunmi of Now said, "The album has a few bright spots: on Irregular Heartbeat, the emcee snarls the stone-faced threats that made him an irresistible menace in the early aughts. But it’s not enough to save an album that’s bogged down by a rapper – and production – stuck in the middle of the last decade." Jesse Cataldo of Slant Magazine wrote "It's unfortunate that 50 Cent can't offer more, tackling his anxieties head-on rather than burying them under the guise of shopworn gangster narratives, but while simple pleasures are about all Animal Ambition can offer, it at least presents them with listenable panache." The album debuted at number four on the Billboard 200 chart, with first-week sales of 47,000 copies in the United States. In its second week, the album dropped to number 15 on the chart, selling 17,000 copies. In its third week, the album dropped to number 23 on the chart, selling 10,000 copies. In its fourth week, the album dropped to number 39 on the chart, selling 7,200 copies. As of December 2014, the album has sold 124,000 copies in the United States. 2. "Don't Worry About It"
7. "Every Time I Come Around"
^ Emmanuel C.M. (December 6, 2013). "50 Cent Putting Out New Project In January - XXL". Xxlmag.com. Retrieved March 22, 2014. ^ Meara, Paul (December 8, 2013). "50 Cent Reflects On Nelson Mandela's Legacy & Importance". HipHop DX. Retrieved February 21, 2014. ^ a b c Balfour, Jay (January 9, 2014). "50 Cent Details "Animal Ambition" Release Plans". HipHop DX. Retrieved February 21, 2014. ^ "50 Cent Talks New SMS Lineup, Google Glass Fears, and G-Unit Reunions". Complex. January 11, 2014. Retrieved February 21, 2014. ^ Tardio, Andres (February 16, 2014). "50 Cent Leaves Shady Records, Aftermath Entertainment & Interscope Records". HipHop DX. Retrieved February 21, 2014. ^ "50 Cent Explains How He Left Interscope, Debuts 'Funeral' Video". Forbes. Retrieved April 25, 2014. ^ Balfour, Jay (May 11, 2014). "50 Cent Details $23 Million Interscope Records Payout". HipHop DX. Retrieved May 20, 2014. ^ "Rapper 50 Cent accepting bitcoin as payment for new album". Latimes.com. June 5, 2014. Retrieved June 11, 2014. ^ "Video: 50 Cent – 'The Funeral'". Rap-Up.com. February 21, 2014. Retrieved May 9, 2014. ^ "Hold On – Single by 50 Cent". iTunes Store. Apple. Retrieved March 18, 2014. ^ "Don't Worry 'Bout It (feat. Yo Gotti) – Single by 50 Cent". iTunes Store. Apple. Retrieved March 18, 2014. ^ "Video: 50 Cent – 'Hold On'". Rap-Up.com. March 18, 2014. Retrieved March 22, 2014. ^ "Video: 50 Cent – 'Don't Worry 'Bout It'". Rap-Up.com. March 18, 2014. Retrieved March 22, 2014. ^ "iTunes - Music - Pilot - Single by 50 Cent". Itunes.apple.com. March 25, 2014. Retrieved April 25, 2014. ^ "Video: 50 Cent – 'Pilot'". Rap-Up.com. March 25, 2014. Retrieved April 25, 2014. ^ "Frequency News". Frequency News. March 31, 2014. Retrieved April 25, 2014. ^ "Video: 50 Cent f/ Trey Songz – 'Smoke'". Rap-Up.com. Retrieved April 25, 2014. ^ "iTunes - Music - Hustler - Single by 50 Cent". Itunes.apple.com. April 15, 2014. Retrieved April 25, 2014. ^ "Video: 50 Cent – 'Hustler'". Rap-Up.com. April 15, 2014. Retrieved April 25, 2014. ^ "50 Cent f. Styles P, Prodigy & Kidd Kidd - "Chase The Paper"". HipHop DX. April 21, 2014. Retrieved April 25, 2014. ^ "iTunes - Music - Chase the Paper (feat. Prodigy, Kidd Kidd & Styles P) - Single by 50 Cent". Itunes.apple.com. July 6, 1975. Retrieved April 25, 2014. ^ "iTunes - Music - Everytime I Come Around (feat. Kidd Kidd) - Single by 50 Cent". Itunes.apple.com. April 29, 2014. Retrieved May 9, 2014. ^ "50 Cent f. Kidd Kidd - "Everytime I Come Around"". HipHop DX. April 29, 2014. Retrieved May 9, 2014. ^ "iTunes - Music - Irregular Heartbeat (feat. Jadakiss & Kidd Kidd) - Single by 50 Cent". Itunes.apple.com. July 6, 1975. Retrieved May 9, 2014. ^ "Video: 50 Cent f/ Jadakiss & Kidd Kidd – 'Irregular Heartbeat'". Rap-Up.com. March 25, 2014. Retrieved May 9, 2014. ^ "iTunes - Music - Winners Circle (feat. Guordan Banks) - Single by 50 Cent". Itunes.apple.com. May 13, 2014. Retrieved May 20, 2014. ^ "Video: 50 Cent f/ Guordan Banks – 'Winners Circle'". Rap-Up.com. May 13, 2014. Retrieved May 20, 2014. ^ a b "Video: 50 Cent f/ Mr. Probz – 'Twisted'". Rap-Up.com. Retrieved May 20, 2014. ^ "iTunes - Music - Animal Ambition - Single by 50 Cent". Itunes.apple.com. May 30, 2014. Retrieved July 21, 2014. ^ "Watch 50 Cent's Video for "Animal Ambition"". Complex. Retrieved June 4, 2014. ^ "Video: 50 Cent – 'You Know'". Rap-Up.com. June 24, 2014. Retrieved July 21, 2014. ^ a b "Animal Ambition: An Untamed Desire to Win Reviews". Metacritic. Retrieved June 4, 2014. ^ a b David Jeffries. "Animal Ambition: An Untamed Desire to Win - 50 Cent". AllMusic. Retrieved June 4, 2014. ^ a b Weekes, Jabbari (June 2, 2014). "50 Cent - Animal Ambition". Exclaim.ca. Retrieved June 4, 2014. ^ a b Pearce, Sheldon (June 3, 2014). "50 Cent - Animal Ambition: An Untamed Desire To Win". HipHop DX. Retrieved June 4, 2014. ^ "50 Cent makes another horrible pitch with 'Animal Ambition'". Latimes.com. June 3, 2014. Retrieved June 4, 2014. ^ a b Killian Fox (May 31, 2014). "Animal Ambition – 50 cent conducts business as usual". Theguardian.com. Retrieved June 4, 2014. ^ "50 Cent's 'Animal Ambition,' music review". NY Daily News. May 27, 2014. Retrieved June 4, 2014. ^ a b c "50 Cent: Animal Ambition". Pitchfork. June 6, 2014. Retrieved June 11, 2014. ^ a b Simon Vozick-Levinson (June 2, 2014). "50 Cent Animal Ambition: An Untamed Desire to Win Album Review". Rolling Stone. Retrieved June 4, 2014. ^ MartĂn Caballero (June 3, 2014). "50 Cent's 'Animal Ambition' comes up short". Usatoday.com. Retrieved June 4, 2014. ^ a b Diep, Eric (June 5, 2014). "50 Cent's 'Animal Ambition' Proves Hip-Hop Still Needs Him". Xxlmag.com. Retrieved June 11, 2014. ^ Sowunmi, Jordan. "50 Cent: Animal Ambition". Nowtoronto.com. Retrieved June 18, 2014. ^ "50 Cent: Animal Ambition: An Untamed Desire to Win". Slant Magazine. Retrieved June 18, 2014. ^ Tardio, Andres. "Hip Hop Album Sales: Week Ending 06/08/2014". HipHop DX. Retrieved June 11, 2014. ^ Tardio, Andres. "Hip Hop Album Sales: Week Ending 06/15/2014". HipHop DX. Retrieved June 18, 2014. ^ Tardio, Andres. "Hip Hop Album Sales: Week Ending 06/22/2014". HipHop DX. Retrieved June 25, 2014. ^ Tardio, Andres (July 2, 2014). "Hip Hop Album Sales: Week Ending 06/29/2014". HipHop DX. Retrieved July 2, 2014. ^ C. Vernon Coleman (May 3, 2014). "50 Cent's 'Animal Ambition' Deluxe Edition Contains Three Additional Tracks, ScHoolboy Q Feature". Xxlmag.com. Retrieved May 9, 2014. ^ "Australiancharts.com – 50 Cent – ANIMAL AMBITION - AN UNTAMED DESIRE TO WIN". Hung Medien. ^ "Austriancharts.at – 50 Cent – ANIMAL AMBITION - AN UNTAMED DESIRE TO WIN" (in German). Hung Medien. ^ "Lescharts.com – 50 Cent – ANIMAL AMBITION - AN UNTAMED DESIRE TO WIN". Hung Medien. ^ "Artisti – Classifica settimanale WK 23 (dal 02-06-2014 al 08-06-2014)" (in Italian). Federazione Industria Musicale Italiana. Retrieved June 12, 2014. ^ "Dutchcharts.nl – 50 Cent – ANIMAL AMBITION - AN UNTAMED DESIRE TO WIN" (in Dutch). Hung Medien. ^ "Swisscharts.com – 50 Cent – ANIMAL AMBITION - AN UNTAMED DESIRE TO WIN". Hung Medien. ^ "50 Cent | Artist | Official Charts". UK Albums Chart. ^ "50 Cent Chart History (Independent Albums)". Billboard. ^ "50 Cent Chart History (Top R&B/Hip-Hop Albums)". Billboard. ^ "2014 Year-End Charts – Billboard 200 Albums". Billboard. Prometheus Global Media. Retrieved February 28, 2015. ^ "2014 Year-End Charts - Billboard R&B/Hip-Hop Albums". Billboard. Prometheus Global Media. Retrieved February 28, 2015. ^ "2014 Year-End Charts - Billboard Rap Albums". Billboard. Prometheus Global Media. Retrieved February 28, 2015. ^ "Independent Albums – 2014 Year End Charts". Billboard. Prometheus Global Media. Retrieved February 28, 2015. This page was last edited on 18 March 2019, at 18:22 (UTC).